FREMONT, Ohio - June 3, 2016 - With family and friends cheering him on, Chad Kemenah, became just the third non-World of Outlaws Craftsman® Sprint Car Series driver to defeat the series regulars after he held off seven-time series champion Donny Scahtz to win the Kistler Engines Smackdown at Fremont (Ohio) Speedway on Friday night. Kemenah, an Elvada, Ohio -native who had not made a World of Outlaws feature at Fremont since 1993, motored around David Gravel just after the halfway point in the 40-lap feature race, then held off a hard-charging Schatz in the final laps to capture the checkered flag. "That was a hell of a show for the fans," Kemenah said after exiting his car. "I don't know how close it was there at the end, but I am pretty sure the fans were in the cockpit there with me. We were the first ones to the checkered flag tonight, and my wife and kids were here to watch it, so this is cool. "I just can't thank my whole team enough, they have worked their tails off this year. I have great car owners in Rod and Rita Hunter, and unfortunately Rob wasn't here to watch this one since he has never won an Outlaw's show before." Schatz, the 2013 and 2014 winner of this race, started fifth and charged his way to a runner-up finish, his best finish since winning at Weedsport Speedway over a week ago. "40 laps here was enough - Chad just did a good job," Schatz said. "It's a work in progress, and every day is a new day to work on it. Tony Stewart's got the best guys in the business to do that, so we will just keep plugging away. "All you can do is your best every night. We had a pretty solid night, obviously we wanted to win, but we just got beat. So some nights you just have to lick your wounds and learn from it." Shane Stewart kicked-off the night by capturing his third consecutive quick-time award when he clocked the fastest time in flight one of qualifying at 12.734 seconds. Flight two was led by local driver, Rob Chaney at 13.141 seconds. Qualifying set up the night-long war between the Outlaws and Ohio drivers, as the series regulars drew first blood by dominating three of the four heat races. Stewart, Joey Saldana and Gravel each won their heat race, while Kemenah was the lone Ohioan to upset the Outlaws when he won the final heat. The Outlaws continued their early-night ownership of victory lane as Gravel, in the Big Game Treestands/JRC No. 5, outdueled Kemenah to win the six-lap dash, which placed the Watertown, Conn. driver on the pole for the feature. When the feature started, the opening laps established a precedent for the remainder of the night as drivers battled a challenging, slick track, which created cautions early and often. Gravel, who was glued to the bottom of the track, held on to the lead through a handful of early cautions as second place starter, Kemenah, in the Brillex LLC/Seneca Energy No. 10H, challenged the leader but could never complete the pass. While Gravel and Kemenah jockeyed over the top position, Schatz lurked in his Bad Boy/Chevrolet Performance No. 15 just behind them in the third position. Kemenah finally built up enough of a run on the outside of Gravel to capture the lead on lap 23, but the Ohioan's path to victory was not an easy one in the final 18 laps. Kemenah began to approach lapped traffic, as the race began a final green-flag run. Once Kemenah hit the slower traffic, Schatz started to close in on the leader. The Fargo, N.D. -native made his way around Gravel, who slipped to third, and placed the Kemenah in his crosshairs. 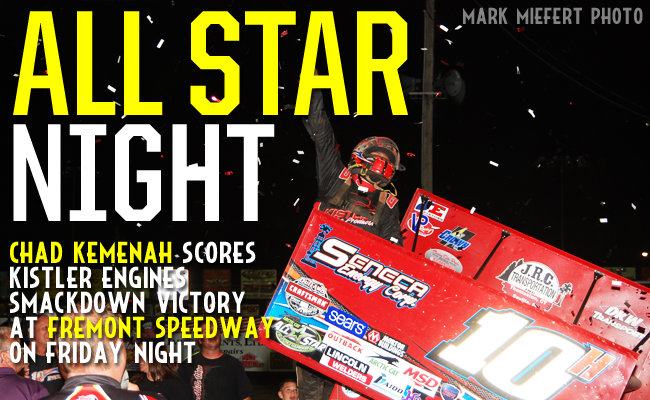 A regular of the All Star Circuit of Champions, which is owned by Tony Stewart, Kemenah had to hold off Scahtz, who drives for Tony Stewart/Curb-Agajanian Racing over the final laps, as the reigning series champion eyed his third win at the track in four years. Schatz closed to Kemenah's back bumper but could never get close enough to make a move, as the Ohioan controlled the top spot over the final 18 laps to become just the third non-Outlaw driver to capture the checkered flag in a series race. "I am just speechless right now - I have to thank everyone that's here," Kemenah added. "If you're a member of this team or have been a part of it, you should be really, really proud because this is a hell of a race team. "We've been pretty good, but last week we had a driver that didn't feel like qualifying good, which turned into a terrible weekend. I can't thank David [Gravel] and Donny [Schatz] enough, they raced here like true professionals - they're the best in the business." Schatz, who admittedly isn't watching the point's battle just yet, has cut Brad Sweet's point lead to just 11 after Sweet struggled to a 15th-place finish. "You guys look at the points - I don't care, I am just about winning races," Schatz said. "That's how I have won what I have won, so I am just going to do that. "We need to get back to winning races, that's for sure. We're going to go back and figure out what we could've done to be better. We have another race tomorrow so we have another shot at it." Gravel, who led the most laps tonight, slipped to third in the second half of the race, but still picked up his second podium finish in-a-row. "I have never got a win here, and I really wanted one tonight," Gravel said. "We probably had the best car the first half of the race but I just faded there late. I had the wing back all the way and that was all I had there, so we will settle for a third. "You never want to back up in the feature, but people like Donny Schatz and Chad Kemenah beat you on a very slick race track, and they're some of the best on the slick tracks. We have a little bit of work to do, but we have been trying stuff and this is something new for us that we are getting better at every week. We've been running really well, we just have to keep it up and the wins will come." 2016 Kevin Gobrecht Rookie of the Year contender Greg Wilson, who is a Benton Ridge, Ohio -native, rebounded from a missed feature at Lawrenceburg Speedway on Monday to finish fourth tonight, which is his third top-five finish of the season. The World of Outlaws Craftsman Sprint Car Series will migrate 200 miles overnight to Lake Odessa, Mich. for the Rumble in Michigan at I-96 Speedway on Saturday. For more race information and ticket purchasing options, visit: www.WoOSprint.com/I-96-Speedway. RACE NOTES: Shane Stewart captured his third quick time in-a-row after also having the fastest qualifying lap at The Dirt Track at Charlotte and Lawrenceburg Speedway...Chad Kemenah made his first World of Outlaws feature at Fremont Speedway since 1993...Kemenah is just the third non-Outlaw driver to win a feature in 2016, joining Kerry Madsen and Lance Dewease. CONTINGENCY WINNERS - MSD Ignitions ($25 cash): Tim Shaffer; MSD Ignitions ($50 cash): Chad Kemenah; Penske Shocks ($50 cash): Donny Schatz; JE Pistons ($50 cash): Jason Johnson; VP Racing Fuels ($50 cash): Jason Sides; Edelbrock ($50 cash): Brent Marks; Comp Cams ($50 cash): Jason Sides; Morton Buildings ($50 cash): Kerry Madsen; Cometic Gasket ($50 cash): Paul McMahan; Super Flow ($50 cash): Brad Sweet; Craftsman/Sears ($100 cash): Chad Kemenah; KSE Racing Products ($100 product certificate): Brent Marks; Comp Cams ($50 product certificate): Chad Kemenah; JE Pistons (Set of Rings): Daryn Pittman; JE Pistons (Set of Rings): Shane Stewart. SEASON WINNERS: Donny Schatz - 7 (Volusia Speedway Park on Feb. 14, The Dirt Track at Las Vegas on March 4, Stockton Dirt Track on March 18, Stockton Dirt Track on March 19, Silver Dollar Speedway on April 2, Lincoln Speedway on May 19, Weedsport Speedway on May 22); Brad Sweet - 6 (Volusia Speedway Park on Feb. 13, Volusia Speedway Park on Feb. 14, Cotton Bowl Speedway on Feb. 26, Ocean Speedway on April 1, Bakersfield Speedway on April 15, Plymouth Speedway on May 13); Daryn Pittman - 4 (Royal Purple Raceway on Feb. 27, Perris Auto Speedway on April 16, USA Raceway on April 18, New Egypt Speedway on May 24); Joey Saldana - 3 (The Dirt Track at Las Vegas on March 3, Devil's Bowl Speedway on April 22, Jacksonville Speedway on May 4);Shane Stewart - 3 (Arizona Speedway on March 6, Devil's Bowl Speedway on April 23, Lawrenceburg Speedway on May 30); David Gravel - 2 (Thunderbowl Raceway on March 12, Tri-State Speedway on May 14); Kerry Madsen - 2 (Eldora Speedway on May 6 and 7); Lance Dewease - 1 (Williams Grove Speedway on May 20); Jason Johnson - 1 (Placerville Speedway on March 24); Chad Kemenah - 1 (Fremont Speedway on May 3); Jason Sides - 1 (I-30 Speedway on April 26); Greg Wilson - 1 (The Dirt Track at Charlotte on May 27). World of Outlaws Craftsman® Sprint Car Series Statistical Report; Fremont (Ohio) Speedway; June 3, 2016.